Pyongyang, North Korea - When nuclear-armed North Korea put on a flower show last year to celebrate the birthday of its founder Kim Il Sung, scale model rockets were on display. But taking pride of place at the national security ministry stand this year was a plant with a record 49 blooms. Pyongyang is on a charm offensive accompanying the sudden diplomatic rapprochement on the peninsula, with a summit due later this month between leader Kim Jong Un and the South's President Moon Jae-in. After making rapid strides in its weapons programmes last year, when intercontinental ballistic missile launches and its most powerful nuclear blast to date earned it several new sets of UN Security Council sanctions, Pyongyang does not want anything to spoil the atmosphere now that talks are at hand. Kim is expected to meet US President Donald Trump soon, and last month he made his first overseas trip since inheriting power to meet Chinese President Xi Jinping. Not a single weapon could be seen depicted among the 80-odd stands at the 20th Kimilsungia Festival in Pyongyang on Friday, mostly set up by ministries and other North Korean organisations. 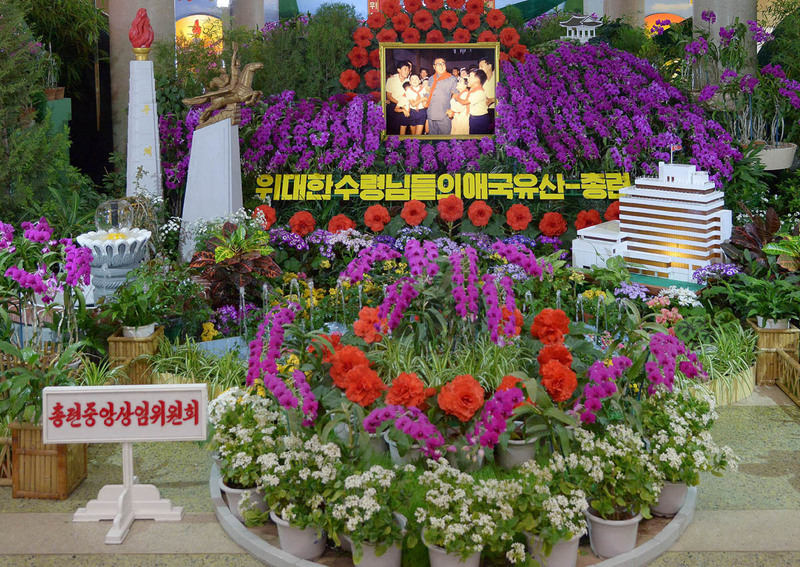 The event is part of the annual commemorations for the anniversary of the birth of Kim Jong Un's grandfather Kim Il Sung on April 15, and features tens of thousands of the purple orchids named after the North's founder by the then Indonesian leader Sukarno in 1965. The ministry of environmental protection offered a bucolic scene of goats, cattle and deer grazing in an orchard nestled in a river valley, just along from the chemical industry ministry's plastic fish in a bubbling cylinder. The Rodong Sinmun newspaper had a model of the Kumsusan Memorial Palace, where Kim and his son and successor Kim Jong Il lie in state. But by far the most common centrepiece was a model of Mangyongdae, the thatched cottage outside Pyongyang where the founder was born in 1912 and now hallowed ground. Mangyongdae was "said to be the hometown of all of our people in their hearts", said guide Ri Jin Ju, 25. 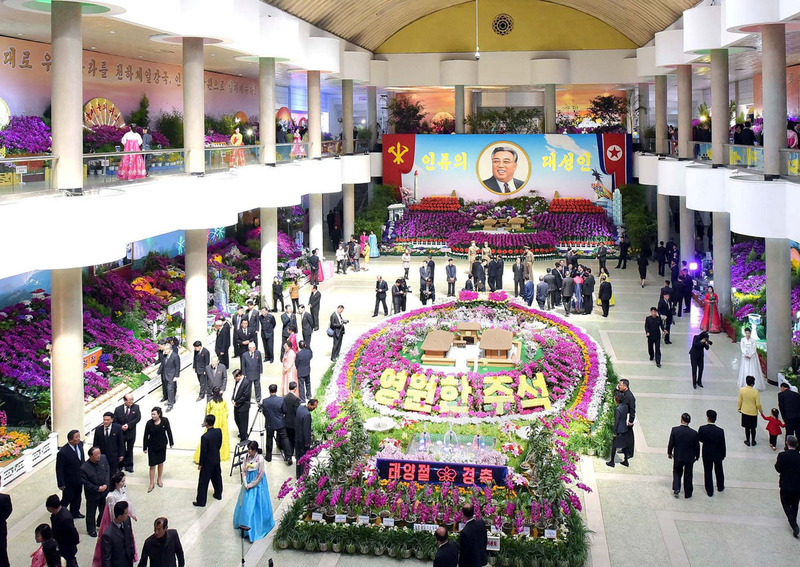 As ever, the main display came from the Guard Command, the military unit tasked with ensuring the personal security of Kim Jong Un and other top leaders, where a Mangyongdae model was surrounded by 1,800 flowers. It was obliquely labelled as simply coming from "the army unit of Kim Song Dok" - the Guard's vice commander. Originally the Kimilsungia had only five to seven flowers per stem, but selective breeding has raised that to 10 to 15, and the national security ministry's record-breaking specimen had 49 flowers on four stems. Ri pointed to the festival's theme "Kimilsungias in full bloom with yearning for our leader" to explain the absence of any show of weaponry. "All these displays in every festival are decorated in memory of him, with our longing for our leader," she said. But for more than a month, the North's KCNA news agency has barely mentioned the country's nuclear capabilities - in marked contrast to last year's regular proclamations that Pyongyang would not hesitate to use its "treasured sword" to defend itself. The South's Moon has been referred to by his proper title, without surrounding quotation marks and using the Southern-style transliteration of his surname. Its condemnations of actions by the US or the South are now often couched in terms of "chilling the atmosphere for dialogue" - although vitriol aimed at Japan and Prime Minister Shinzo Abe appears to continue unabated. And it has cut back on references to US military threats. In an analysis of KCNA content for the respected US website 38 North earlier this month, Robert Carlin wrote that Pyongyang had been "clearly signalling - both in what it has and what it hasn't said - a very different posture than it did last year". At the same time, he added, "it has begun to open up space for a negotiating position to deal with the issue".